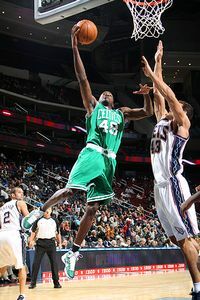 Stephane Lasme pushed Von Wafer for a final roster spot out of Celtics' training camp.The Maine Red Claws announced Thursday that Stephane Lasme, a final camp cut of the Boston Celtics and an affiliated player, will make his regular-season debut Thursday night after recovering from a fractured foot in the team's only preseason game. The Maine Red Claws, presented by Quirk Chevrolet, today announced that forward Stephane Lasme will make his Red Claws’ regular season debut tonight at Erie. Expected to be an integral part of the Red Claws’ plans this season and an NBA call-up candidate, Lasme, who joined the Red Claws in training camp out of the Boston Celtics camp as one of three Affiliated Players, fractured his foot just 2 minutes into the team’s lone preseason game and was not expected to return this season. Drafted by the Golden State Warriors in the 2nd round (46th overall) in the 2007 NBA Draft, Lasme played one game for the Warriors during his rookie season before joining the Los Angeles D-Fenders of the NBA D-League. He earned a GATORADE call-up when he signed with the Miami Heat in March of that season, appearing in 15 games in which he averaged 5.5 ppg and 3.5 rpg. Lasme took his game overseas for the next two seasons, playing for teams in Serbia and Israel before earning an invite to the Boston Celtics 2011 training camp. A four-year standout at the University of Massachusetts, Lasme is the school’s all-time leader in career blocks (399) and second all-time in field-goal percentage (.595). As a senior, he became just the third player in NCAA history to record four triple-doubles in a single season. With the return of 2011 1st round draft pick (3rd overall) Magnum Rolle, also felled by an early season injury just two games into the season, and now Lasme, the Red Claws more closely resemble the roster expected when the season began. To make room on the roster, the Red Claws have waived Lewis Clinch. Click HERE to read more on Lasme's time with the Celtics.